After much fretting about the bike ride, I did it. 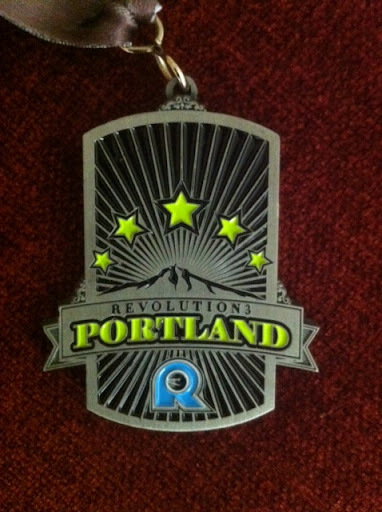 I completed the Revolution 3 half Ironman distance triathlon in Portland. Like my medal? The bike ride was both a tremendous success and a tremendous failure. I rode really well. I had hoped not to put a foot down anywhere along the course, but I did end up touching ground a couple of times. My first stop was a mental hiccup upon coming on the first steep leftward switchback. I panicked. Had I not panicked, I think I could have done it. The second stop was on the last segment of the last climb, and it was just a bit too steep for me. If I can get good at climbing out of the saddle, then maybe I can do it next time, but yesterday, that portion got the best of me. Still, I’m proud of my ride. It took much longer than I would have liked – about four and a half hours, but I felt strong. I knew my riding had been improving, but it was nice to see that I could handle multiple long climbs without too much difficulty. Where I failed on the ride was in the nutrition. I was so obsessed with focusing on the technical and climbing aspects of the ride that I forgot to eat and drink. I carried three bottles with me. One contained water. One contained water with Nuun (electrolytes). One contained water with a protein powder. I also carried three packages of Shot Blocks. I should have consumed at least all of that on the ride and maybe even picked up a couple more things from the aid stations. But I didn’t. I drank the water and the water with Nuun, and I ate a single Shot Block. Not a package of Shot Blocks, but a single Shot Block. And that was it. So when I finished the ride, I was empty. I had basically nothing left for the run. That was the failure. As a result, my run ended up being a painfully slow run/walk. I even face-planted from my exhaustion at one point in a comical way. I was “running” and saw Erin coming the other direction. She was a few miles ahead of me, and the course was set up as two different out and backs so we saw each other at two different segments. When I saw her up ahead, I waved and said, “Erin, I’m so tired.” And I flopped. I tripped on some unevenness in the path – basically, I just didn’t pick my feet up enough – and landed face-down on the ground. She helped me up. I admired the blood on my knees, and on I went to a slow and painful “run.” I felt a little silly, but then I felt cool to be running with blood dripping down my legs. That was a first! In my head, I could pretend the blood was from a cool biking accident. I would say the nutrition element was a good lesson learned, but I’m pretty sure I’ve learned this lesson before. A few times. But I must – I absolutely must – get into a regular practice of eating and drinking on the bike. That’s the only way to run a marathon after a 2.4 mile swim and a 112 mile bike. I need to get that right for Canada. A couple of other cool things happened that are worth mentioning. Before the race, I met a girl from Houston who was also racing the half. It was her birthday and her very first triathlon. I saw her on the run course. She was somewhere between me and Erin, so I’m sure she finished. Happy birthday to her. Also, I met Oregon Senator Jeff Merkley. He was racing too, and we struck up a conversation when we were both trudging along on the bike. He was super nice and welcoming of me to Oregon. That was another fun race under my belt. Tomorrow, I’m heading back to Texas. I have about seven weeks to make some adjustments towards Canada. Oh Canada. The Wisdom of Jordan Rapp. I’m doing a half-Ironman tomorrow. Normally, that distance event comes with a little stress, a little fretting, and some jitters. Yesterday, that’s about how I was feeling about tomorrow’s race. Then today, Erin and I drove the bike course. Oh. My. Goodness. Hills. Switchbacks. 180-degree turns. Crazy long and fast downhills. This course is loaded. Last year, the course was 56 miles of flat. This year? They went totally the other way. We think we’re okay. We think it’ll be okay. But, honestly, we aren’t sure. After we drove the course, we checked in and dropped off our bikes. Then we waited for the athlete’s meeting to hear last minute cautions related to the course and the rules. Before the meeting, the race organizers did a panel with the pros, largely asking them about the horrific bike course. (“Horrific” is my word, not theirs.) At one point, listening to their varying degrees of concern, I started to panic that even the pros seemed rattled by this new course. Then they handed the microphone to Jordan Rapp, who won Ironman Canada in 2009, was left for dead after getting hit by a car on a training ride in 2010, and came back to win Ironman Canada 2011. Rapp talked about his excitement over the challenge to come. He said that it’s exciting to get out there and see if you can crack a course before it cracks you. He’s right. Yes, I would love to be doing the race course from last year that was flat, flat, flat the whole way. But this race course, this new bike course will be a challenge for all of us. This course is the stuff stories are made of. What will my story be? I don’t know, but for the next few hours, I’m working on seeing myself getting up those hills, taking the downhills safely, making each turn smoothly, and getting off the bike in one piece. I’m preparing myself to crack the course before it cracks me. Thanks, Jordan, for the pep talk. I needed that.